We go through a lot of prototype PCBs, and end up with lots of extras that we’ll never use. Every Sunday we give away a few PCBs from one of our past or future projects, or a related prototype. Our PCBs are made through Seeed Studio’s Fusion board service. This week we’re giving away two PCBs for our new xQFP protoboard (0.65mm only). 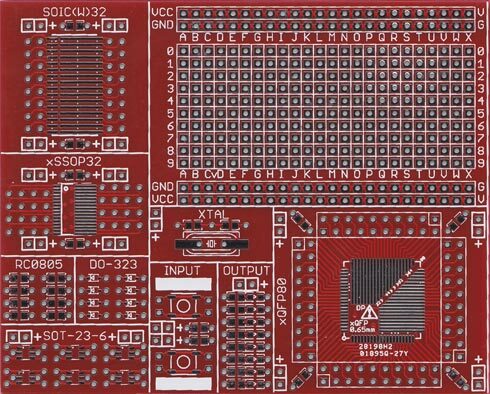 This giant protoboard has a xQFP breakout footprint, along with a score of other pads for SMD parts. Currently available in 0.50mm, 0.65mm, and 0.80mm. If you’d like a PCB just ask for one in the comments. Please specify a size, freebies available in 0.65mm and 0.50mm only. Available in 0.50mm, 0.65mm, and 0.80mm for $10, read about the design on the wiki. Are you interested in blogging with us? Drop us a line. This probably won’t be a paid position, but you get a back stage pass, free PCBs, and free projects. US and international bloggers are welcome. Be sure to use a real e-mail in the address field so we can contact you for shipping info. First come, first serve. If we can’t contact the first commenters, or there’s no reply within 24 hours, we move down the list. You could consider making a request even if it looks like all the PCBs are gone. We try to stagger free PCB Sunday posts so every time zone has a chance to participate, but the best way to see the post first is to subscribe to the RSS feed. This entry was posted on Sunday, March 13th, 2011 at 6:59 pm	and is filed under Free PCBs. You can follow any responses to this entry through the RSS 2.0 feed. You can skip to the end and leave a response. Pinging is currently not allowed. So great you’re doing this! If you can spare one, I’d like a 0.5mm please. If it is not really late, I’d like a 0.5mm one please. I’d like a 0.5mm one if they are still available. Thanks. Hey. I would like one in 0.8 please! Thank you! I’d love a 0.5 if possible, but if those are gone, I could use a 0.65 instead. Thanks! would love a 0.50mm one please!! I love this one…. je,je,je. i need 200 but one is pretty. I’d love a .5mm one!